Many times we send files to others (or they send them to us) and we do not see what is expected. You get strange looking fonts or no text at all. You are missing XREF files. You find that you are missing many things. Worse than that you may not even know what you are missing. Unless you know what is happening, you are confused and frustrated. It has happened to all of us at some point. eTransmit can help alleviate these problems. Packaging a drawing is not as easy as a Word document. 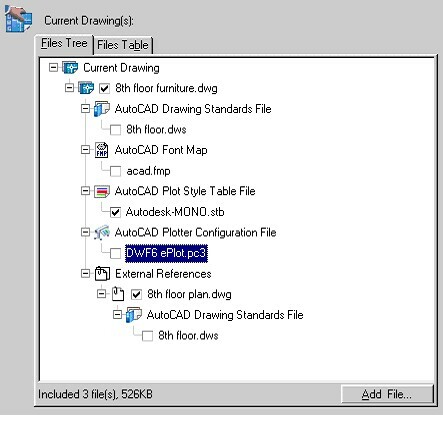 That's because AutoCAD drawing files are not standalone. They are usually created by collecting and referencing data from a number of other files. The other files might include fonts, plot styles, font mapping, images, and externally referenced drawings. Finds all the files associated with the drawing. Collects the files into a single compressed file, a self-extracting file, or a folder of files; allows you to lock the collection with a password. Optionally strips paths from xrefs and image files. Generates a Web page with a link to the files, instead of sending the package as email. 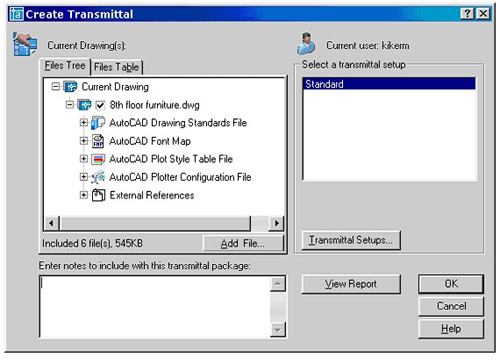 Produces a report, which includes instructions to the recipient. Including TrueType fonts (TTF) may be an issue, because they have copyrights. Caution: While drawings can be emailed, they can be very large, which means they can take a long time to send or receive over a slow Internet connection like dialup (who has that anymore?). When you expand the File Tree tab you are shown all of the files that will be transmitted. The check marks show you which files are included. If you do not want a file to be transmitted, uncheck it. HINT: I would typically not send the DWS files, or my PC3 file. Notice that it shows you how big the total file sizes will be at the bottom. You can click on the Add File button to add additional files. HINT: Prior to 2005, any Additional files that you add are not scanned for supporting files or Xrefs.